After watching a few offensive DVDs the over the summer and coaching pulling drills over the years, I tweaked my pull blocking drills into my Pull Blocking Pod Youth Football Drill Station. I also added blocks for the Split End, Tail Back and the Full Back so we can get everyone involved in the blocking drill. It is my experience that the running backs do not receive enough blocking training, so now I include them in a drill with our lineman. Hopefully, they are picking up more blocking tips by just being in a “real blocking” drill rather than hitting bags while walking through plays with the running backs’ coaches. I know my RBs are improving this year because my fullback this season has made a significant improvement in his lead blocking since I installed this drill along with the lead blocking pod drill station. The pull blocking drill pod consists of 6 blocking stations; 3 for lineman and 3 for running backs and receivers. In the above football drill diagram the orange objects are blocking dummies. The white circles are youth football players. You can run this drill left or right. I switch directions after everyone has done 2 reps one way then move to the other direction. All the lineman rotate into the drill and start in the left offensive tackle position and perform a fill block for the pulling left guard. The left guard pulls around the dummy tackle bag to perform a seal block on the inside LB. The right guard pulls and will either trap block the dummy or try to reach and seal the dummy based on the coaches call. The lineman rotation is waiting line, left tackle, left guard, and right guard then end of line. Once every lineman has done to reps to one side we rotate to the other side for two reps. The running backs and receivers rotate from waiting line, TB, FB to Split End to end of line. The TB performs a block on a moving dummy blitzing to the backfield, The fullback makes a block on a blitzing LB and the receiver tries to seal block the CB. The key for the running backs in the drill is not to let them walk through the drill and bounce off the bags. You want to explain to them to hold their blocks and “Super Glue” to the defensive players. I also tell the RBs that the first bad guy to touch you is your block, because if you pass him up, that player usually touches and or tackles the RB, especially if you are lead blocking. All too often our running backs whiff their blocks or just plain do not block. As the lineman coach I try to emphasize to them that the running backs should learn to block for each other. Blocking by the RBs is the key for big gainers. To make the drill tougher you can start moving the dummies into the holes or laterally down the LOS making the blockers work and think harder about the blocks. I find the key to pull blocking and blocking in space is control. It is very similar to the type of control you need to break down on a form tackle. The player must slow down a tad to gain control prior to impact so they do not lose their target on a whiff. Let me know what you think of my Pull Blocking Pod Youth Football Drill Station. 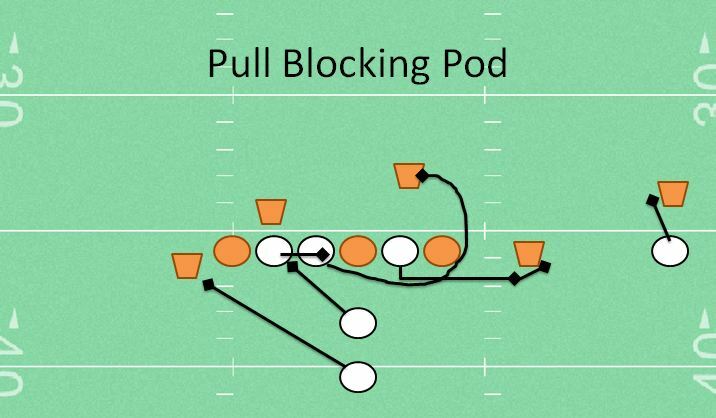 How do you teach and coach pull blocking to your youth football players? Leave a comment. I would love to hear from you.